Rolex occupies this rarified position of being the most famous luxury watch brand in the world, while also being one of the most secretive companies in the entire industry. This intriguing juxtaposition has bred an air of mystery surrounding the cult of Rolex watches, replete with plenty of myths. Read on for the truth behind some popular Rolex myths. Let’s get to the bottom of some popular Rolex myths. This particular tidbit of (false) information is one that is often thrown around when discussing how to spot a fake Rolex watch – and busting this myth is two-fold. First, “ticking” watches are associated with quartz watches. The seconds hand on a quartz watch moves one position every second (for a total of 60 “jumps” every minute) and does so with a loud “tick” sound. Since most people associate quartz watches with cheap watches, they assume that Rolex never made quartz watches; and that is false. Rolex no longer makes quartz watches today, but it has in the past. Rolex quartz watches include the ref. 5100 with a Beta-21 quartz caliber, the Rolex Oysterquartz watches with in-house quartz calibers, and Cellini quartz watches. And all these Rolex watches certainly tick. The other side of this myth is that mechanical watches technically also “tick,” albeit at a much faster pace, which gives the impression of the seconds hand sweeping around the dial. The self-winding calibers that power modern Rolex watches operate at 28,000 beats per hour, which is equal to 8 ticks per second. The Oysterquartz collection is an entire range of quartz-powered Rolex watches. And they all most certainly tick. See myth #1 above. And also check out the awesome Oysterquartz Day-Date and Oysterquartz Datejust watches while you’re at it. 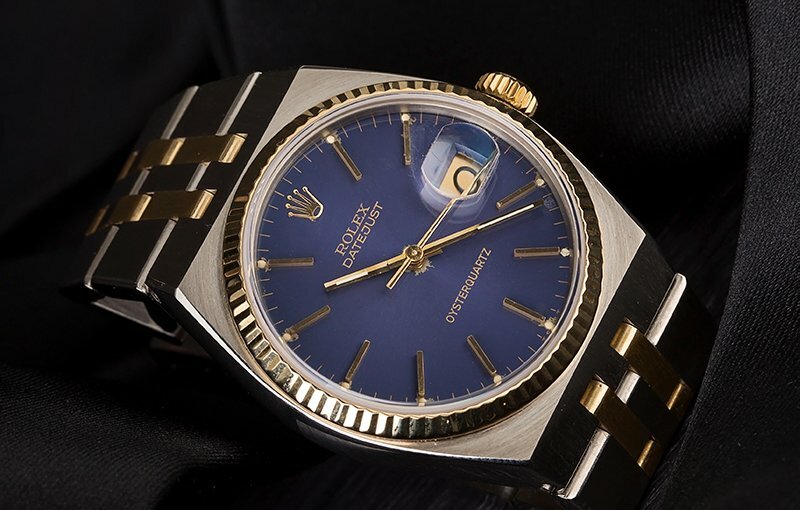 Rolex actually spent five years developing in-house quartz calibers after the company decided to abandon the Centre Electronique Horloger (CEH) consortium. The CEH’s mission was to create a Swiss-made quartz movement worthy enough for its esteemed 20-brand membership list, which included (along with Rolex) Patek Philippe, Omega, Piaget, and others. The result was the Beta-21 quartz caliber, which powered the Rolex ref. 5100 (“The Texan”), Patek Philippe 3597, Omega Electroquartz, and more. But Rolex eventually created in-house quartz movements; the Cal. 5035 for the Oysterquartz Datejust and Cal. 5055 for the Oysterquartz Date-Date. It is estimated that only 25,000 Oysterquartz watches were made from 1977 until 2003. The very first quartz Rolex watch: the ref. 5100, also known as “The Texan” among today’s vintage collectors. Yes, it’s true that today, Rolex only uses 18k gold – cast in an on-site foundry, no less – to craft gold and two-tone watches. 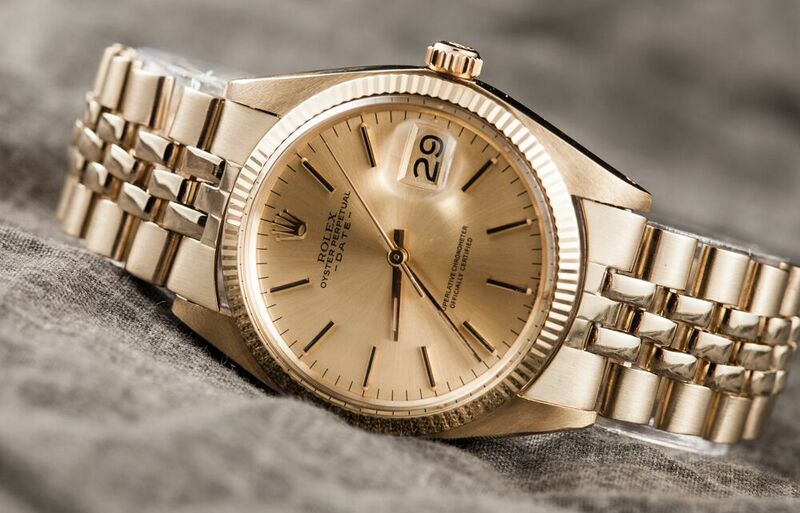 And yes, Rolex even has a proprietary pink gold alloy named Everose (introduced in 2005). However, this was not always the case. 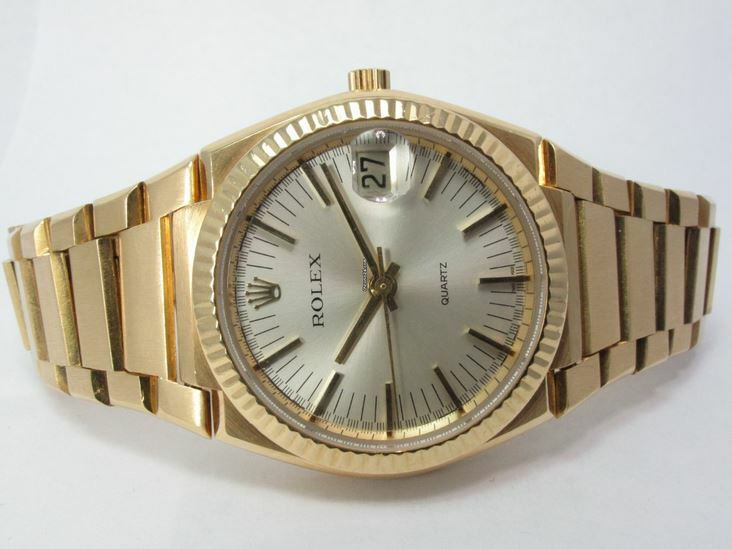 If you look at vintage Rolex watches, you’ll find versions in 9k and 14k gold as well. What’s more, Rolex even made gold shell watches at one point, where the stainless steel surfaces are “capped” with a thick gold layer. These are sometimes referred to as “Golden Egg” Rolex watches. This Rolex Date ref. 1503 with Jubilee bracelet is craft entirely from 14k gold, rather than 18k like stated by one of the more popular Rolex myths. 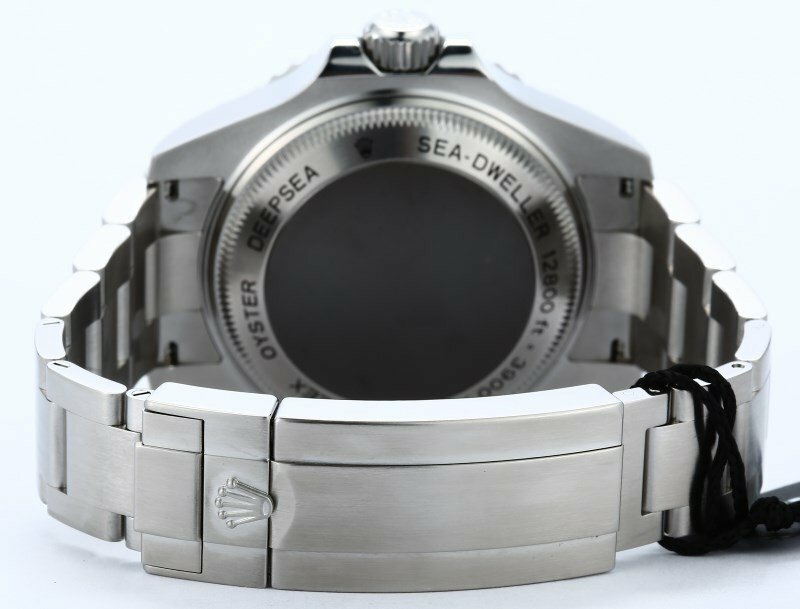 Many luxury watch brands use the casebacks of their watches as a canvas to engrave logos, numbers, medallions, and special inscriptions. On the other hand, the solid fluted screw-down casebacks of Rolex watches are famously unadorned. However, to say that Rolex casebacks never have any markings is simply untrue. For instance, flip the Milgauss 116400 around, and you’ll see the words “ROLEX OYSTER” and “MILGAUSS” around the periphery. Furthermore, on the caseback of Rolex Deepsea watches, you’ll spot “ROLEX OYSTER DEEPSEA” and “SEA-DWELLER 12800 ft = 3000 m” text on there. In fact, even vintage Sea-Dweller models have engravings on the back, which include “ROLEX PATENT OYSTER GAS ESCAPE VALVE” and other etchings. 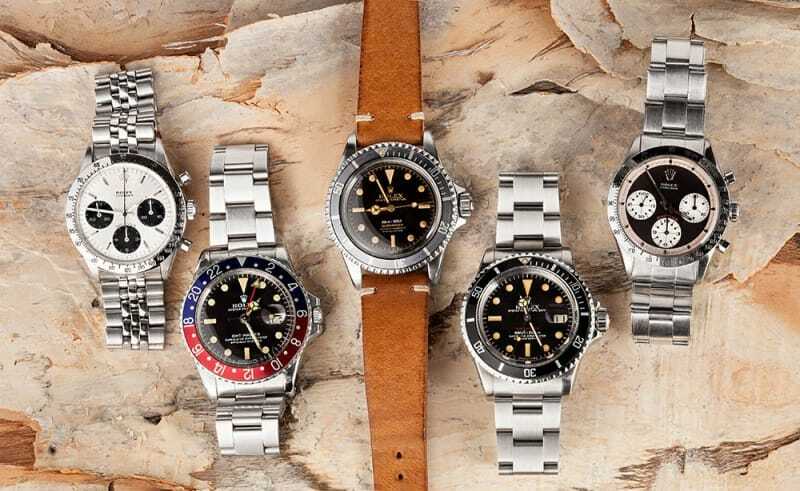 Rolex Submariner Milsub casebacks also had plenty of markings to identify them as military-issued dive watches. Finally, some casebacks of Lady Datejust and gold Lady President watches even have “ORIGINAL ROLEX DESIGN” engraved on them. So while it is rare that Rolex casebacks have markings (and it could be a red flag if you’re trying to determine authenticity), the blanket statement that Rolex casebacks never have any markings is a myth. One of the most popular Rolex myths is that Rolex casebacks never have engravings. Well, here’s an engraved Rolex caseback. 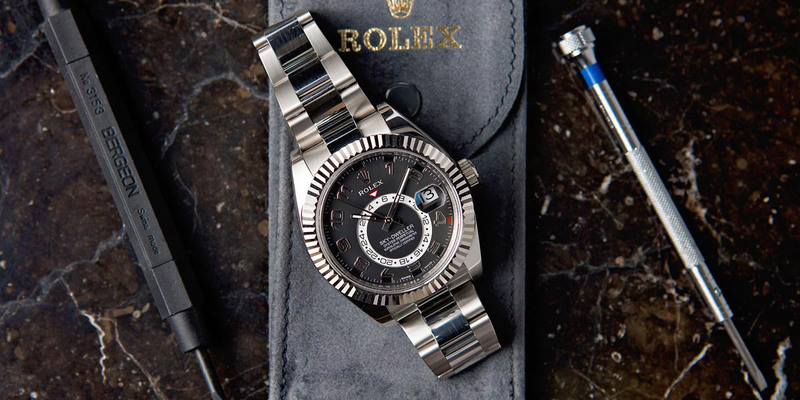 This myth comes courtesy of some watch enthusiasts who like to pigeonhole Rolex as watch brand that makes simple high-quality timepieces, void of any complications – which is far from the truth. A “complication” is any function on a watch other than telling the time. Complications can range from a straightforward date window to technically impressive chronographs to highly complex annual calendars. Therefore, Rolex certainly makes complicated watches! Along with all the famous Rolex watches with date windows and the iconic Day-Date collection, let’s not forget that Rolex boasts GMT watches, dual time watches, chronograph watches, and moon phase watches. Plus, there are also the newer Yacht-Master II watches packed with a flyback chronograph, countdown timer, and mechanical memory, and the highly complex Sky-Dweller annual calendar watches. So the next time you hear one of these popular Rolex myths, you’ll know better than to believe them. The Rolex Sky-Dweller has an annual calendar complication that keeps track of the different numbers of days in each month. That is rather complicated, wouldn’t you agree?